For the most part, Andre Norton is remembered for her fantasy and science-fiction novels, especially the WITCH WORLD series of novels. Many readers might be surprised to know that she also wrote a good number of non-SF/Fantasy books, including historicals, mysteries, and romances. AT SWORDS'S POINT is one her spy thrillers, the third (and last) of the SWORD novels that focus on political adventures in the post-WW2 era. 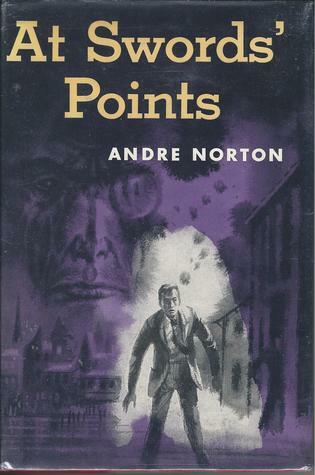 This one has a nice bit of history in it as well, as the protagonist searches to discover lost artifacts and solve the mysteries behind his brother's death.As usual, it's a compelling story, and Norton relishes the opportunity to teach her readers a thing or two as they are swept along in the narrative. I have to admit that I "googled" a few of the locations just to get a visual of the places she described.Recommended for history buffs, and Norton fans. I'm not sure this is the edition I read: I may've read it in hardcover. I have the impression that this was the 1st book in a trilogy, followed by The Sword Is Drawn, then Sword in Sheath.Not sure about this: I wasn't really coherent when I was reading these older books. Lack of food will do that to you. Another book read two decades ago, about which I remember little except that I enjoyed it. I remember it was a mass market paperback with a red cover, and I bought it cheap at Odd Lots when I was in high school. At Sword's PointExcellent conclusion to the trilogy. Known characters from the first two books are now in strong supporting roles, action, adventure, spies, caves, hidden treasure, very enjoyable. Typos in translation from book to kindle not corrected. Hiss!